This volume is a broad-ranging guide to Othello, providing an introduction to the contexts of the play, the range of critical responses to the play and the play in performance. William Shakespeare's Othello (1601-2) has delighted and disturbed theatre audiences for the past four centuries, and remains one of the most frequently performed and widely studied of his plays. 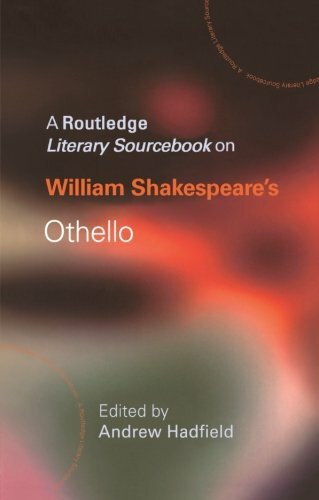 This volume is a broad-ranging guide to Othello, providing an introduction to: *the contexts of the play, through a concise, accessible overview, a chronology and reprinted documents from the period *the range of critical responses to the play, through a brief critical history and reprinted critical texts, accompanied by explanatory headnotes *the play in performance, through a selection of clearly introduced readings on this topic, along with illustrations. The sourcebook then examines key passages of the play in detail. Each passage is reprinted in full, along with a headnote and annotations offering crucial guidance to Shakespeare's language and the critical issues which surround the text. Throughout the volume, cross-references link together the contextual materials, critical responses and the play's text. If you are beginning to study Othello, this sourcebook is the one guide you cannot afford to be without.